Cowboy poet/songster, storyteller, wrangler and museum curator are among the hats that sixth generation Floridian Doyle Conner Jr. has worn or wears. 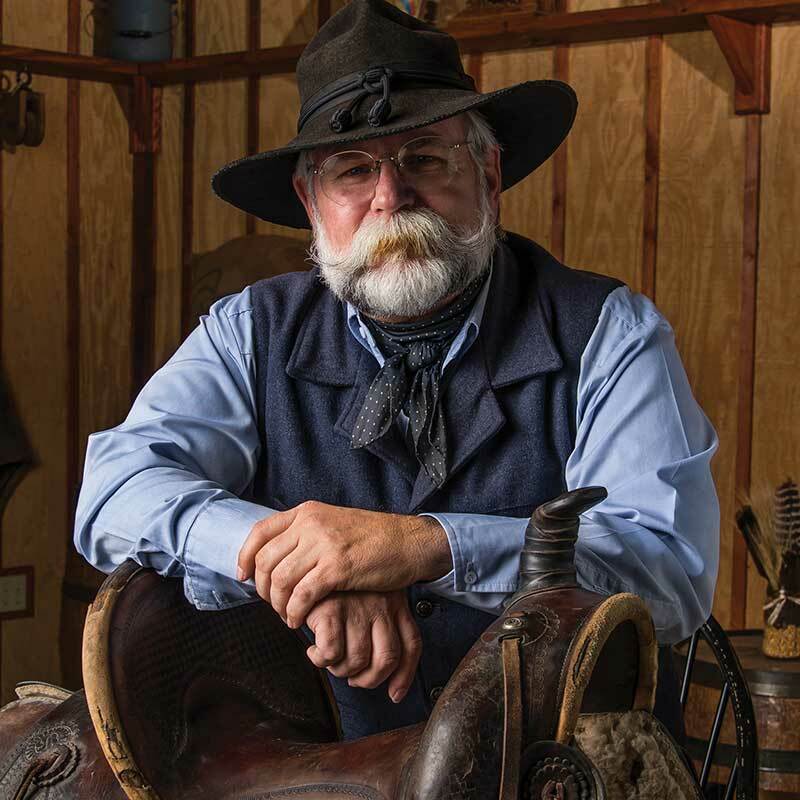 A history buff with an affinity for Florida’s colorful “Cracker” cowboy past, Doyle sports a bushy beard, favors Western wear and flavors his language with folksy lingo. His poetry, songs and storytelling are his means of keeping alive Florida’s cowboy tradition, which he will tell you dates from 1521, when Ponce de Leon brought the first horses and cattle to the Americas. Doyle counts among his crowning achievements organizing and “trail bossing” a six-day, 80-mile reenactment cattle drive across central Florida in 1995 to celebrate the state’s sesquicentennial, a feat he repeated in 2006 and 2016 and plans to revisit in 2021. His passion, however, is restoring old saddles, many of which are in private collections or such institutions as the Smithsonian, the Will Rogers Memorial Museum, Cowboy Hall of Fame and the Gene Autry Museum of Western Heritage. It all started in boyhood, when he was charged with caring for the family’s stable gear. “It got to where I really liked the old-timey stuff and started collecting antique saddles and all kinds of cowboy things,” he says, noting his family’s long ranching and horse raising history. His father, the late Doyle Conner Sr., was Florida Agriculture Commissioner for 30 years and owned the Bar-C Ranch in Jefferson County, just east of Tallahassee. Doyle himself lives in Monticello, in a rambling purple-painted house decorated with Western motifs. A livestock inspector for the Florida Department of Agriculture, Doyle works on his leather restorations evenings and weekends in a barn on the Bar-C.
A restored saddle, he says, can bring anywhere from a few hundred to several thousand dollars, depending on its age, condition and maker. “When you get into collectibles, a Bohlin Silver saddle, for example, can easily sell for $200,000,” he says, referring to saddle maker Edward H. Bohlin (1895-1980). A collector himself, Doyle lost all his prized pieces to fire several years ago. Although not commonly found nowadays, especially in Florida, where humidity, mold and mildew destroy leather, antique saddles turn up occasionally out West, where the drier climate tends to preserve them. That’s when Doyle’s expertise kicks in. Slow and methodical, the restoration process employs various techniques, depending on the nature and condition of the leather. It may entail adding or removing moisture; applying oils, cream, and chemicals; or replacing deteriorated parts and aging them to fit unnoticeably. “It can take years,” Doyle says. Typically, saddle restorations begin with the tree, or wood-frame foundation. A sound tree makes for a good starting point. If both the tree and leather are fine, all the better, Doyle says. Doyle has restored saddles dating from medieval times. “Knights’ saddles and whatnot,” he says. His favorites, however, are high-back cowboy saddles from 1880 to 1920. “I don’t care if they’re fancy,” Doyle says. It’s the stories the saddles tell that especially fascinate him. “An old saddle can tell what happened in its life,” he says. “I’ve always been one who enjoys stories, whether they’re written, rhymed or sung,” he says knowingly. Or imprinted on leather, one might add.